Attrition is the physical wear of teeth as a result of heavy chewing, biting, or wearing against other teeth (like with orthodontic malocclusion). Teeth with attrition appear shortened in height. Skin allergies and resultant chewing may cause attrition of the incisors (front teeth). 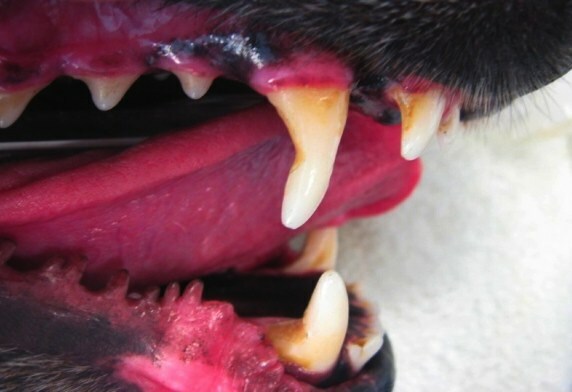 Tennis balls and frisbees are often the cause of wear of the canines and premolars. The surface of a tennis ball is similar to fine sandpaper when dirt and grit are present. 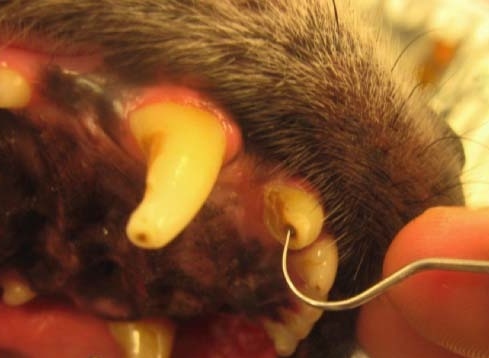 Chewing of metal cages and other hard objects may also cause attrition of the canines and the back teeth. Wear of the back of the canines from cage biting can be seen above right. With slow wear, crown surfaces become smooth and flat and develop a tan-to-brown reparative (aka tertiary) dentin seen in the center of the tooth. The reparative dentin is formed to protect the teeth. However, teeth with rapid wear do not have a chance to repair themselves. These teeth may have exposed pulp canals susceptible to pain and infection. In other cases, the pulp may become inflamed and lead to pulpitis, tooth discoloration, and tooth death. Dental attrition necessitates a complete oral exam including orthodontic assessment. Transillumination may be performed to evaluate pulp vitality. A dental explorer, drawn across the worn tooth surface should feel smooth. For complete tooth evaluation, radiographs (x-rays) are needed. Signs of endodontic problems on x-rays may include wider than normal pulp canals, periapical radiolucency, or internal or external root resorption. For teeth displaying gradual attrition yet no pulp compromise or canal exposure, treatment may not be necessary. Monitoring is advised and efforts should be made to rectify the cause. When wear is extensive and pulp canal exposure has resulted, root canal therapy or extractions are required. In some cases of severe attrition, metal crown placement may be considered to provide structural protection to the weakened tooth.